Taking a look at the controversial decision to “mortgage” a young boy to the Venetians, and why children were used as political hostages in the Middle Ages. In the year 1248, Empress Marie of Brienne set out on a quest to free her five-year old son. Marie was the last in the line of crusader empresses of Constantinople. Married to Baldwin II, they had begun their rule of the Latin Empire in 1240. However, their rule was not easy. The state was the political heir of the Fourth Crusade, when a crusader army bound for Jerusalem instead conquered Constantinople, and established crusader rule in parts of the old Byzantine Empire. I say parts, because their takeover was vigorously opposed by a trio of Greek successor states all claiming they were the rightful Byzantine emperors, unlike the French usurpers in Constantinople. Added to this list of enemies were the ambitious Bulgarians, and a new player who invaded Eastern Europe and the Latin Empire, just after Baldwin and Marie took the throne: the Mongols. With a long list of foes, Baldwin and Marie quickly fell into debt, taking a loan of 24,000 hyperpers from Venetian merchants. This loan came with a catch, however, which was that their young son Philip of Courtenay would be given as collateral in case of the non-payment of that loan. Lacking the funds to repay the Venetians, Philip soon was shipped to Venice where he was put up in the home of two merchant brothers, John and Angelo Ferro; there he would remain until the year 1260. Marie spent a decade travelling Europe trying to gather the capital to repay this loan. She finally received help from her royal cousin, King Alfonso IX of Castile who paid the Venetian merchants to set Philip free. No single event has defined the image of Baldwin II more than the fate of Philip of Courtenay. Modern historians have universally decried this incident as Baldwin mortgaging, pawning, or even selling his only son to the Venetians. The story is so popular because it confirms not only the image of Baldwin II as medieval Europe’s preeminent pauper, but it also reinforces dark myths about Venice as a city of Shylocks out for their pound of flesh. However, the incident goes almost unmentioned by Baldwin’s contemporaries, even by Greek historians with polemical axes to grind. This silence speaks to the fact that while this incident appears exceptional and scandalous to modern historians, it was something a medieval reader would find very common. Philip of Courtenay was simply a hostage. In his recent book, Hostages in the Middle Ages, Adam Kosto argues that in its medieval understanding, the defining feature of hostage-ship was not compulsion, but instead a contract: “A hostage was a form of surety, a person (potentially) deprived of liberty by a second party in order to guarantee an understanding by a third person.” This makes a hostage politically distinct from a captive, “who is deprived of liberty, but not as a surety.” This political distinction was understood in medieval sources. One clear example of this can be seen in the registers of Philip Augustus. After his victory at the Battle of Bouvines in 1215, Philip distinctly lists the hostages, called hostagii, given by Flemish towns, and the captives, called prisoners, taken in the battle. Philip fell into the former category. Moreover, Kosto notes that for a ruler of medieval Europe, giving a child as a hostage was commonplace, citing dozens of examples. What seems exceptional and scandalous to modern historians is the fact that Philip was given as a hostage, not for political reasons, but for a debt. Yet in the High Middle Ages, hostageship shifted from being a diplomatic tool to a much more monetized institution. From the end of the twelfth century onward, the use of hostages for purely financial transactions, outside the usual context of warfare, became routine. As a result, giving children as surety for a debt was by no means exceptional in the thirteenth century and has multiple precedents even within Baldwin’s own social circle. One such precedent involved a future Queen of France, Blanche of Castile, and her sons, most notably the future St. Louis. The minstrel of Rheims records that while her husband, Prince Louis the Lion, was fighting against King John to claim the English throne, Blanche approached her father-in-law, King Philip Augustus of France, to ask for aid. Fearing excommunication, the king refused. Blanche then said, “By the blessed mother of God, I have fine children by my lord; I shall pawn them, and shall easily find someone to lend me money in exchange for them.” She then stormed out of the room, “like a madwoman,” the minstrel reports. At this point, Philip Augustus gave into Blanche’s demands, promising to give her whatever she wanted from his treasury. While Blanche’s offer to mortgage her children was almost assuredly a bluff, another of Baldwin’s relatives actually signed over one of his sons. In 1256, Baldwin II’s kinsman and rival, John of Avesnes, gave one of his sons as a hostage for a large sum of money. After the death of the previous Holy Roman Emperor, John became the chief agent for the brother of the king of England, Richard of Cornwall, in Richard’s quest to be elected to the German throne as Holy Roman Emperor. Doing all he could to win the election for his ally, John purchased the vote of Duke Louis II of Bavaria in the imperial election. The agreement stated that John would arrange for Louis to receive the hand of one of the daughters of King Henry III of England and an accompanying sum of twelve thousand marks, to be paid in two installments, pre-arranged over the next year. On 26 November, 1256, they signed this agreement and John gave one of his sons as a hostage for the surety of these promises. Duke Louis never received the hand of the English princess, but fortunately for John, the promised cash was delivered and that appears to have been good enough to assure his son’s release. Closer to home, Baldwin II may not have been the only Latin emperor of Constantinople to mortgage his children. The chroniclers John of Ipra and Matthew Paris mention that John of Brienne – Marie’s father – mortgaged his sons as collateral for his debts incurred fighting the Greeks. John then redeemed them by mortgaging some of the relics of Constantinople in their place, including the Crown of Thorns. 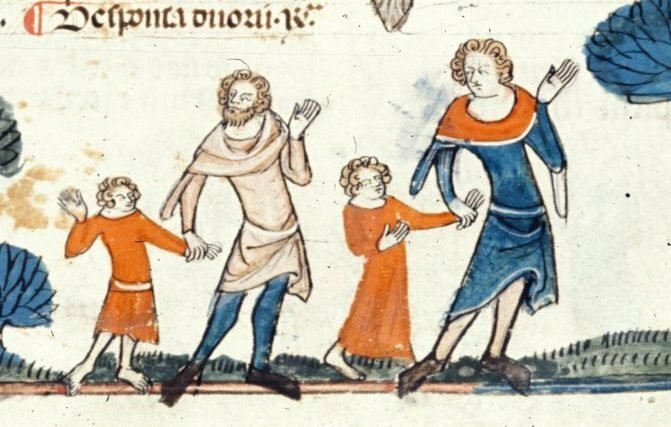 More examples of mortgaging children to pay debts can be cited, including Berthold of Zahringen using his nephews as hostages for a bribe in the 1198 imperial election, or the king of Sardinia granting child hostages for a debt he owed to Genoa. Nevertheless, the point here is that what at first seems like an exceptional story, when put into the broader context of history can be seen as just another interesting quirk of the fascinating times we know as the Middle Ages. John Giebfried holds a PhD in Medieval history from Saint Louis University, specializing in the crusades and the Mongol invasions. He is currently a post-doctoral fellow at the Hebrew University of Jerusalem. Click here to visit his Academia.edu page.